This section is strictly for enthusiasts. There are many steps, but it is very satisfying when you can drop your own component onto a form and change its properties using the Object Inspector. 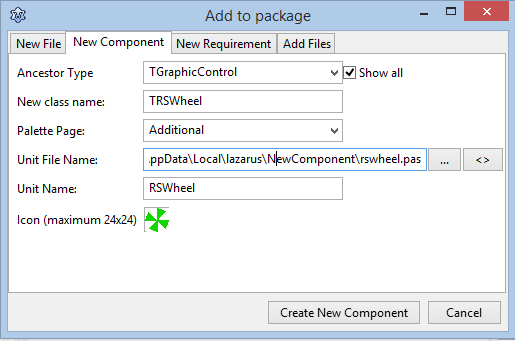 The following steps describe how to create a component, develop it and install it in Lazarus. These steps make it easy to include your own icon for display in one of the component tabs; the icon is automatically converted to a resource file and a reference to it included in the automatically generated source file. 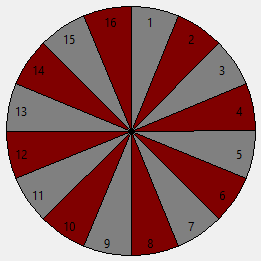 This new visual component is very loosely based on a roulette wheel, hence its name. Prepare and your own 24 x 24 icon such as in a graphics application such as Paint and save it (as a .png file, for example). Create a new application to test the new component and save it in a safe place. We created a folder C:\Users\PPS\AppData\Local\lazarus\NewComponent, selected menu item File > Save All, saved the project as NewComponentTest and the unit as uNewComponentTest. Select menu item Package > New Package and save it as TRSWheel. Click on the Add icon in the Package dialogue to see the Add to package dialogue then select the New Component tab. Click the Create New Component button. 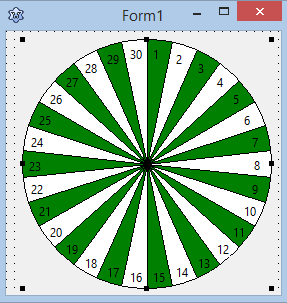 You should now see the code of the new unit RSWheel. Add code to the new unit. Select menu item Package > Open Recent Package, select your new package, and click on the Compile icon. You should see a message that the compiling has completed. Select menu item Use >> > Install and accept the invitation to continue. Select your test unit in the source editor, press F12 to see the design view of your empty form and drop the new component onto it. Change some properties in the Object Inspector and compile the test application.